This topic contains 18 replies, has 12 voices, and was last updated by Warbofrog 2 months ago. Last night I saw the fantastic Frank Turner & The Sleeping Souls at Alexandra Palace. I’ve seen Frank 16 times over the last 12 years and he never fails to put on a fantastic show. Last night was extra wonderful though as when the band hit the last note of their encore, the Red Dwarf end credits music started blasting over the speakers which made for a nice sing along as 10,000 of us shuffled out of the venue. This has me wondering where Dwarf might have unexpectedly popped up in your lives. Other examples I have are my line manager saying at a work curry night “well, as we all know, lager is the only thing that can kill a vindaloo” and I distinctly recall reading an article completely unrelated to Dwarf (or even TV or sci-fi geekery) that used a joke that could only have been pulled from Dwarf. Cannot for the life of me remember what the article was about or which joke it referenced though! I’ll try and recall. Not exciting/interesting, but it’s probably noticing a ‘Red Dwarf’ tab in the old-school back issues section of a comic shop and finding the full set of sealed Smegazines there, which I’d read about but never expected to see for real (don’t think we were online yet, so no idea about eBay). This was only 5-6 years after the last ones would have been on newsagent shelves, but it felt like I’d discovered rare artefacts from an impossibly distant age where series VI was brand new. I guess finding a Red Dwarf novel in the library for the first time and learning that there was more than a TV series might have been even more surprising, but that’s getting a bit general isn’t it? 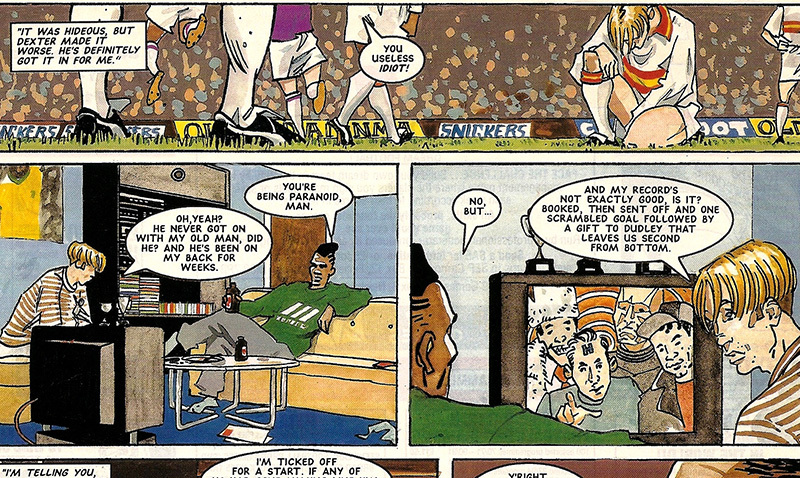 Also spotting Red Dwarf references in Sonic comics as a kid and adult, which is more what you’re talking about. – Little Britain, the hypnotist at the car boot. Hadn’t seen the Super Hero Squad Show one. Brilliant! Hereford Crematorium during an above average sombre moment of a cremation for instance! No longer have the theme as a ring tone and I tend to check my phone is set to vibrate at events more these days. I’m sure there are one or two mentions in The Mary Whitehouse Experience Encyclopedia but I’ll have to look for them. There’s also Smeg in Roger’s Profanisaurus. That “Smeg oven shop” line in Peep Show is there because Sophie Winkleman’s in BtE, isn’t it? I think they pretty much say so on the DVD commentary. I played an American computer game called ‘Gone Home’ a couple of years ago, where you’re exploring round an empty house in 1995. In one room there’s a TV Guide listing a small selection of shows, including Red Dwarf. Then proceeded to play Tongue Tied in full. A hilarious gear change after all the roaring hard rock. Absolutely made my night. Many people in the crowd looked in their early 20s & frankly baffled at this inexplicable cheesy 80s pop number. Even if I was the only person the DJ amused, it was worth it. Not Dwarf, but I went to go see Avenged Sevenfold and Stone Sour in Glasgow in 2010/11, and before Stone Sour’s set they blasted Duel of the Fates from The Phantom Menace, which was pretty hype. Yeah I’ve seen bands come onto the stage and leave the stage to a tonne of different, unexpected things. Walking out of an Iron Maiden gig singing along to “Always Look on the Bright Side of Life” is always good fun but Red Dwarf is far more niche than Star Wars or Monty Python so the themes appearance was all the more surprising; especially as it started playing at full volume the actual second the show ended/before the band had even put down their instruments. Plus, having met Frank a few times back in the day, I can attest to the fact that he’s a top bloke. Now I know he’s a top bloke who also has good taste in comedy. I was in Cardiff last year and in the Fuel bar they have a load of pictures of bands and musicans over the walls, including some other pop-culture stuff. I was watching the Star Cops episode ‘Trivial Games and Paranoid Pursuits’ and noticed that the chairs on the American space station they’re investigating were the same yellow high chair in the I & II Sleeping Quarters. Bonus points, the flashing lights on the Star Cops’ computer BOX was recycled to make the flashing lights on Talkie Toaster. Another Star Cops connection is MacDyne appearing in both, it’s Paul McGuinness’ (of Curry Monster, Psirens beetle fame) go to fake brand. Frank Turner’s favourite film is Morons From Outer Space. This is an actual fact. Wasn’t sure if this deserved a thread or even a G&TV of its own, since they might all be well-known, but YouTube channel JGAdventureZone has lots of the 90s adverts voiced by the cast all in one place and is still uploading new ones. Ctrl+F for Barrie, Lovett, whatever’s your poison.